Mr. Devin is an adjunct professor in HEC Montréal’s Department of Logistics and Operations Management. 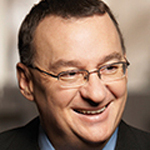 He served as the director general of the Société de transport de Montréal from 2006 to 2012. Under his leadership, the organization overcame its poor reputation in terms of employee performance and engagement to become a model of efficiency, winning award after award for service quality, community stewardship and environmental commitment. Experience as a senior human resources executive and general manager of the Casino de Montréal. Consultant and corporate director.